Martin Torkelson, born in Jackson County, served the State of Wisconsin for more than fifty years. He was a pioneer in the development for both land and air trans­portation. 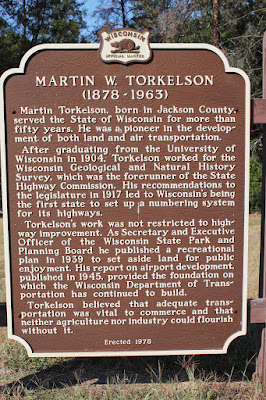 After graduating from the University of Wisconsin in 1904, Torkelson worked for the Wisconsin Geological and Natural History Survey, which was the forerunner of the State Highway Commission. His recommendations to the legisla­ture in 1917 led to Wisconsin's being the first state to set up a numbering system for its highways. Torkelson's work was not restricted to highway improvement. As Secretary and Executive Officer of the Wisconsin State Park and Planning Board he published a recreational plan in 1939 to set aside land for public enjoyment. His report on airport development, published in 1945, provided the foundation on which the Wisconsin Department of Transportation has continued to build. Torkelson believed that adequate transportation was vital to commerce and that neither agriculture nor industry could flourish without it. The marker is at a wayside the intersection of Fall Hall Road and Wisconsin Highway 27, on the right when traveling west on Fall Hall Road, near Black River Falls, Wisconsin 54615.